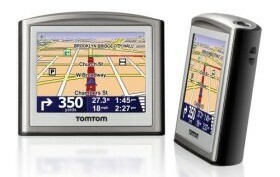 The Tom Tom One (3rd edition) has been a hot item in stores for some time now. But if you’re looking for one of the best bargains at the Black Friday sales this year (2007), put this GPS unit at the top of your list! With a retail price of $249, it’s already a pretty sweet deal — as far as reliable GPS units go. So if you’re in the market for a GPS unit (my hand is raised very high right now), this is a great deal. And notice… you also get a $20 Staples gift card! 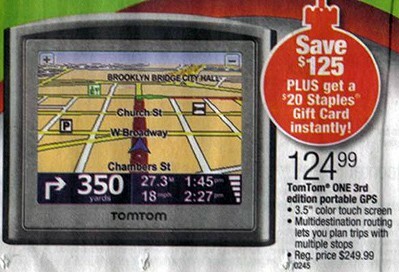 See for yourself… you’ll be hard pressed to find the Tom Tom One (3rd edition) for less than $249 these days — even online! Check out this Tom Tom One carrying case! This heavy-duty nylon case protects your TomTom One GPS when it’s not in use, or when you’re out & about. …Have fun at the Black Friday shopping events, everyone!